V: Glory be to the Father, and to the Son, and to the Holy Spirit. R: As it was in the beginning, is now, and ever shall be, world without end. Amen. 1. I grieve for you, O Mary, most sorrowful, in the affliction of your tender heart at the prophecy of the holy and aged Simeon. Dear Mother, by your heart so afflicted, obtain for me the virtue of humility and the gift of the holy fear of God. Hail Mary, full of grace, the Lord is with thee. Blessed art thou among women and blessed is the fruit of of thy womb, Jesus. 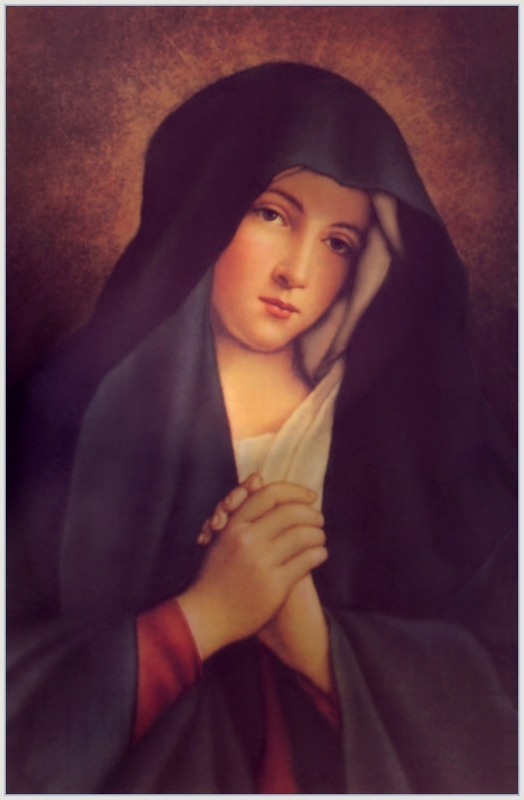 Holy Mary, Mother of God, pray for us sinners, now, and at the hour of our death. Amen. 2. I grieve for you, O Mary most sorrowful, in the anguish of your most affectionate heart during the flight into Egypt and your sojourn there. Dear Mother, by your heart so troubled, obtain for me the virtue of generosity, especially toward the poor, and the gift of piety. 3. I grieve for you, O Mary most sorrowful, in those anxieties which tried your troubled heart at the lost of your dear Jesus. 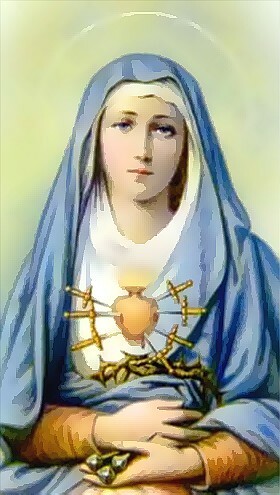 Dear Mother, by your heart so full of anguish, obtain for me the virtue of chastity and the gift of knowledge. 4. I grieve for you, O Mary most sorrowful, in the consternation of your heart at meeting Jesus as He carried His cross. Dear Mother, by your heart so troubled, obtain for me the virtue of patience and the gift of fortitude. 5. I grieve for you, O Mary most sorrowful, in the martyrdom which your generous heart endured in standing near Jesus in His agony. Dear Mother, by your afflicted heart, obtain for me the virtue of temperance and the gift of counsel. 7. I grieve for you, O Mary most sorrowful, for the pangs that wrenched your most loving heart at the burial of Jesus. Dear Mother, by your heart sunk in the bitterness of desolation, obtain for me the virtue of diligence and the gift of wisdom. O sorrowful Virgin, unite me at least to the humiliations and wounds of thy Son, so that both He and thee may find comfort in having someone sharing thy sufferings. Oh, how happy I would be if I could do this! For is there perhaps anything greater, sweeter, or more advantageous for a person? Why dost thou not grant me what I ask? If I have offended thee, be just and pierce my heart. If I have been faithful to thee, leave me not without a reward: give me thy sorrows. O afflicted Virgin, O soul great in virtues, as in sorrows, both the one and the other spring from that great fire burning in thyr heart for God, the only love of thy heart! 2.They will be enlightened about the Divine mysteries. 7. I have obtained this Grace from my Divine Son, that those who propagate this devotion to my tears and dolors, will be taken directly from this earthly life to eternal happiness since all their sins will be forgiven and my Son and I will be their eternal consolation and joy. O God, in whose Passion, according to the prophecy of Simeon, a sword of grief pierced through the most sweet soul of Thy glorious Blessed Virgin Mother Mary: grant that we, who celebrate the memory of her Seven Sorrows, may obtain the happy effect of Thy Passion, Who lives and reigns world without end. Amen. 7. The Burial of Her Son and Closing of the Tomb.